In addition to the premanufactured foundation and soil drainage systems, there are also available drainage systems used in conjunction with both vertical and horizontal belowgrade waterproofing systems. These drainage systems provide additional protection against water infiltration and effectively reduce hydrostatic pressure against below-grade envelope components. The products aid in the drainage of groundwater by collecting and conveying the water to appropriate collection points for drainage away from the structure. A simplified typical design is shown in Fig. 2.7. FIGURE 2.7 Simplified design detailing for premanufactured drainage system. The products provide low-cost insurance against water infiltration and should be used with every below-grade waterproofing application (with the possible exception of hydrous-clay materials). More often than not, the drainage systems can be used in lieu of protection board for most membrane applications, effectively negating any additional costs for the system’s superb protection. The system is similar to the prefabricated soil drainage systems only available in larger sheets and drainage cores to facilitate drainage. The material consists of a formed plastic three-dimensional core that acts as the collector and drainage transporter of the water, as shown in Fig. 2.8. The plastic drainage product is also covered with a geotextile fabric to prevent the silt, soil, clay, and sand from clogging the drainage system. The systems usually have some type of plastic sheeting adhered to one side to protect from indenting waterproofing membranes as well as acting as an initial water-proofing system. FIGURE 2.8 Typical manufactured drainage systems. The systems not only eliminate the need for protection board, but also eliminate the requirement for special backfill material consisting of sand or gravel materials to promote drainage. Typically, the existing soil is used as backfill material, reducing the overall costs of new construction. 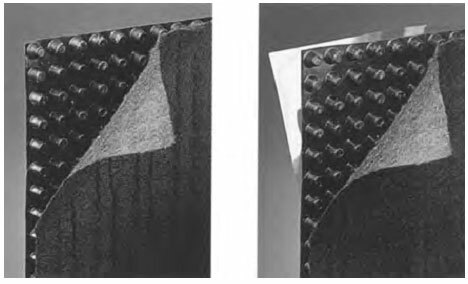 A typical below-grade wall detailing, using the drainage as protection for the waterproofing membrane, is detailed in Fig. 2.9. The systems also provide a drainage flow rate (depending on the size of plastic core structure, which varies from 1 4 in to 1 2 in) 3–5 times the capacity of commonly used drainage back-fill materials such as sand or small aggregate fill. The material is obviously lightweight, with one person capable of carrying the average roll of material that covers as much as 200 ft 2 of substrate, the equivalent of a small dump truck of aggregate backfill. Materials selected should have a high compressive strength to protect waterproofing applications (a minimum of 10,000 psf). Also, the system should be resistant to any chemicals it might be exposed to, such as hydrocarbon materials at airports. ● Attached filter fabric or geotextile eliminates the usual clogging of traditional systems. ● High-strength material can be used in lieu of protection board for membranes. ● Provides belt and suspender protection for below-grade spaces by quickly channeling ground and surface water away from the structure. ● Permits backfilling with the excavated soils. ● Lightweight and idiot-proof installations.